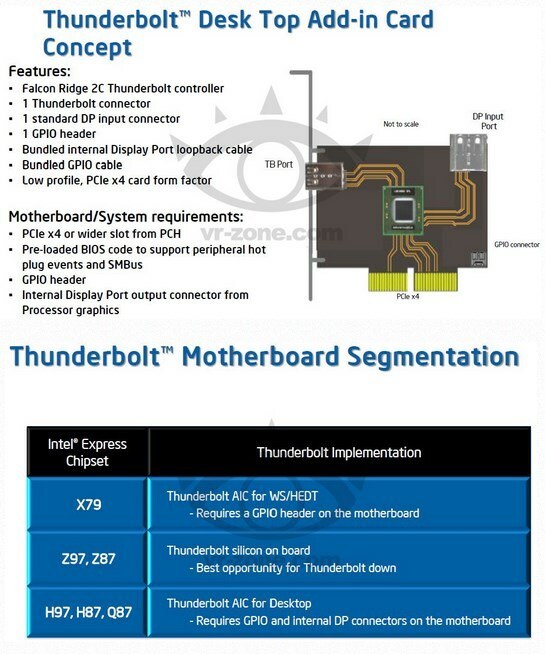 VR Zone reports Intel is creating a reference design for a Thunderbolt add-in card. The image below shows off the concept, each add-in card will feature a Falcon Ridge 2C controller, one Thunderbolt connector, one standard DP input port, one GPIO header and cable and a bundled internal display port loopback cable. It's unknown when these cards may hit the market, nor do we know the intended price class. The card will require a PCIe x4 or wider slot from the motherboard’s platform controller hub, a supporting BIOS that can manage SMBus as well as hot plug events, and an internal display port output connector. In the peripheral connectivity sector the competition is fierce, and Intel needs to do all it can to get Thunderbolt into as many PCs are possible. This effort it handicapped by some bad press coming from earlier this year, most notably USB 3.0 beating Thunderbolt at a transfer test. Pushing out Thunderbolt via PCIe cards can lift Thunderbolt’s numbers and bring its price down by busting Intel’s self-constructed monopoly.